New tips in the December 2009 slaying of a prominent civil litigation attorney at his home in Rolling Hills Estates have prompted investigators to ask for the public’s help in solving the case. 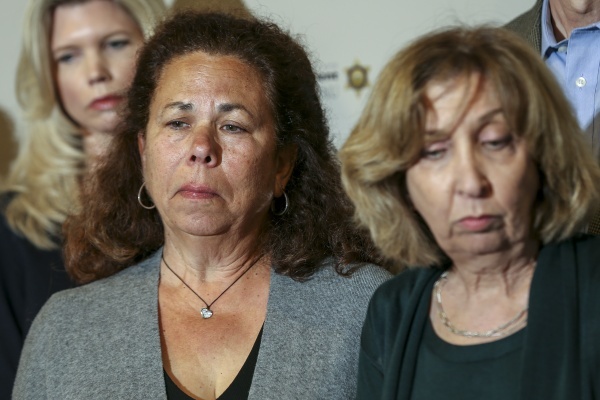 On Wednesday, family members and detectives gathered for a news conference at the Los Angeles County Sheriff’s Department homicide bureau to publicize a $100,000 reward in the killing of Jeffrey Tidus, 53. “It is our belief that there are people out there who know about this murder,” Sheriff’s Lt. Victor Lewandowski said. Although detectives declined to state the specifics of the new leads, Lewandowski said that people have come forward in the last few months to offer new information that connects the attorney’s work with his killing. About 8:30 p.m. Dec. 7, 2009, Tidus had just walked outside to get a computer from his car when his wife, Sheryl, heard a pop, then a car driving off. When she walked outside, her husband was on the ground. He died the next day. The killing shocked the wealthy community on the Palos Verdes Peninsula. In 2011, the L.A. County Supervisors, along with Tidus’ family, offered the $100,000 reward for information about the slaying. The reward is still available. Tidus worked with a number of well-known clients, including New Century Financial, Isuzu Motors, California Federal Savings and Tokai Bank. In the last year of his life, Tidus had won several large settlements, his wife previously told the Los Angeles Times. Over the years, detectives have examined many of the attorney’s cases for possible links to his death. On Wednesday, Det. Joe Espino said there are people of interest in the case, including a former Los Angeles tax attorney, Christopher Gruys. Tidus won an $11.2-million judgment against Gruys in 2007. The Times previously reported that during a deposition in 2005 in that case, Gruys pulled out a camera, took a picture of Tidus and made what Tidus interpreted as a threat. Tidus obtained a restraining order against Gruys. The State Bar of California placed Gruys on interim suspension in April 2007 after he was convicted of possession of an assault weapon. He gave up his California law license later that year. Espino cautioned that Gruys was not the only person of interest in the killing. “We’re looking at various people and looking at various cases,” he said. After the news conference, Sheryl Tidus said she thinks about her husband every day. The killing, she said, still feels “surreal.” Saturday would have been the couple’s 33rd wedding anniversary.